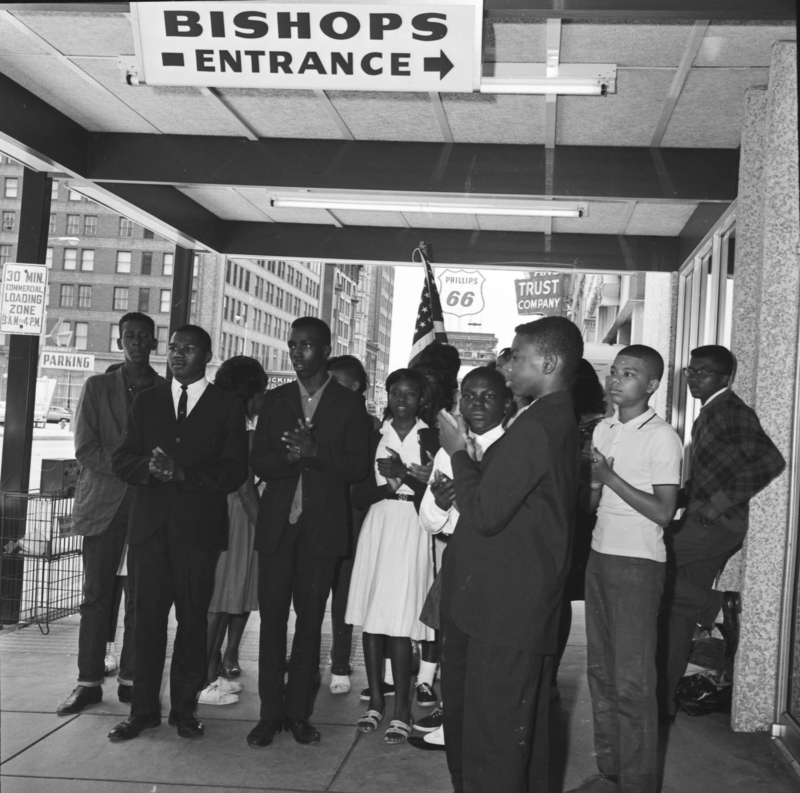 Protest at Bishop's Restaurant in Oklahoma City, June 1, 1963 (20246.38.83.1, John Melton Collection, OHS). African Americans have a long history in Oklahoma. They first came to Oklahoma during the forced removal of American Indians because some tribes held African Americans as slaves. There were also African Americans who were American Indian and free. During the Civil War, many of these men in Indian Territory joined the war on both the Union and Confederate sides. Called Buffalo Soldiers, these African American servicemen played a vital role in Oklahoma and Indian Territory as well as in other regions of the West. Both the 9th and the 10th Cavalries and the 24th Infantry served in Indian Territory during the latter nineteenth century. Stationed at Fort Gibson, the 1st Kansas Colored Volunteers Infantry Regiment (later supplemented with the 2nd Kansas) fought at Cabin Creek and at the pivotal engagement of Honey Springs in July 1863. After the Civil War ended in 1865, all of the slaves in the United States, including Indian Territory, were freed. Known as freedmen, many continued living among the Indians. Many African Americans participated in the land openings in Oklahoma. Some came from the Southeast in hopes of new opportunities to own their own land and escape persecution. Some African Americans worked together to create All-Black towns. E. P. McCabe, for example, founded Langston, Oklahoma. Other African Americans also lived among whites in other communities. During the Civil Rights Movement, African Americans fought to achieve equality as citizens in American society. They fought for the right to vote, for access to public places, and for equal education. The Civil Rights Movement fought against racism and discrimination. Racism is when someone thinks they are better than someone else based on the color of their skin. Discrimination is similar to racism, but applies to judging and mistreating people based on their religion, background, class, ethnicity, gender, or race. The Civil Rights Movement occurred during the mid-twentieth century, although the movement continues as African Americans and people of different races in America continue to work towards complete justice and equality for all. When most people think of the civil rights era, they often think of events that happened in the South, in states like Alabama, Mississippi, and Tennessee. However, events of national importance to the civil rights movement happened right here in Oklahoma. As Oklahomans, we must remember the atrocities, the long-fought struggles, and the victories of the civil rights era in order to understand our culture and our laws today. The struggle for civil rights continues today as people of various races, backgrounds, genders, sexual orientation, and religions are not always treated equally and with respect. For example, calling someone gay as an insult is a form of discrimination. Bullying is an example of discrimination that happens today when people do not respect or understand someone who is different from them. The following pages will help you learn about the Civil Rights Movement in Oklahoma. As you read, think about what you can do to continue promote equality, respect, and fairness in your school or community.